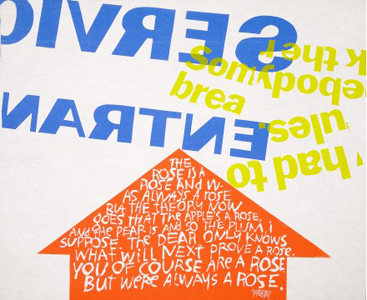 To create is to relate will be the first exhibition in Canada of the influential work of Sister Corita Kent who came to fame for her silkscreen prints while teaching at Immaculate Heart College in Los Angeles in the 1960s. The exhibition developed in association with the Corita Art Center, Los Angeles and MOCFA, San Francisco focuses on Corita’s work from this period when we see the rapid visual move from a muted palette to one where figurative style is replaced by an increasing use of large areas of intense abstract colour. Mixing advertising slogans and poetry in her silkscreens and commandeering nuns and students to help make ambitious installations, processions and banners, Corita’s work is now recognized as some of the most striking – and joyful – American art of the 60s. The exhibition also shows a shift in the manner Corita brings words into her compositions often fragmented whereby they become image. The size of the serigraphs also increases and for Corita the absorption of the burgeoning media signage, commercial systems and slogans she saw play an important role in the development of her work. She embraced the urban environment, the commonplace becoming far from empty wasteland, rather a vehicle for hope and rejoicing. In someday is now (1964) for example, the partial block letters clearly derive from SAFEWAY supermarkets; somebody had to break the rules (1967) has the phrase jumbled but taken from a laundry detergent of the day. Corita’s work and its community engagement marked a decade of utopian thinking but were rooted in the belief that direct action can cause real change. As such she asserts the continuum between daily life and art through her work, and challenges our expectations of what and how we encounter art. This lack of division between form and activity makes for a compelling argument against the notion of detached art experience both for artists and the audience. In this way, it chimes with the Contemporary Art Gallery in our belief that art and its conventions should not be divorced from our everyday experience and have meaning to everyone.